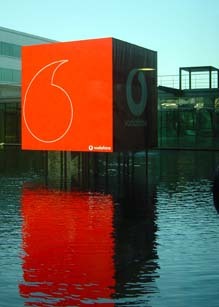 The objective of the project was to create an environment that offered visitors to the headquarters an opportunity to experience Vodafone's brand values. The project is thereforeconcerned with how people behave and their relationship with their mobile device. The outcome of embedding the technology within the architecture allows the viewer to interact with a 16 square meter display using their mobile phones and via interfaced furniture. A re-imagined reception area, meeting spaces and branding for the international communications giant results in an interactive 3m LED cube that transforms public space in Lisbon. 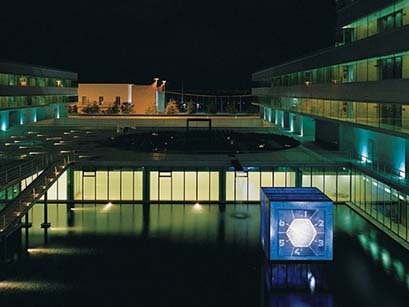 The client welcomed the cube as a perfect realisation of the company’s raison d’être. It turns downtime into uptime – waiting becomes an engrossing activity. Even more powerfully it insinuates itself into lifestyle. The Cube is strategically positioned within a field of vision embracing both visitors to the HQ and a significant public route, and through its interactive content, it modifies public space itself.